If you are new to using glyphosate you might wish to read these posts before reading this one. I do not recommend the advanced methods below for new gardeners who don’t know their plants. For inexperienced sprayers if you just jump in you might kill your garden and for those of you who would not touch glyphosate with a barge pole this will confirm all of your prejudices. If you are in the latter category and read on out of curiosity it might make you shudder. My notes today are more in the nature of updates, methods you might have missed in obscure posts and just a little new stuff. My current brand of glyphosate is called Rodeo. A correspondent recently mentioned he had sourced Gallup! It continues to amaze me the names they dream up that evoke images of the old coral for this generic product. I always used to warn students. My own advice reared up and kicked me when I took early retirement and went freelance and had my own clients. Twice I jumped and resigned before I was pushed! (I proclaim my total innocence). I could tell you several amusing stories but dare not in public. 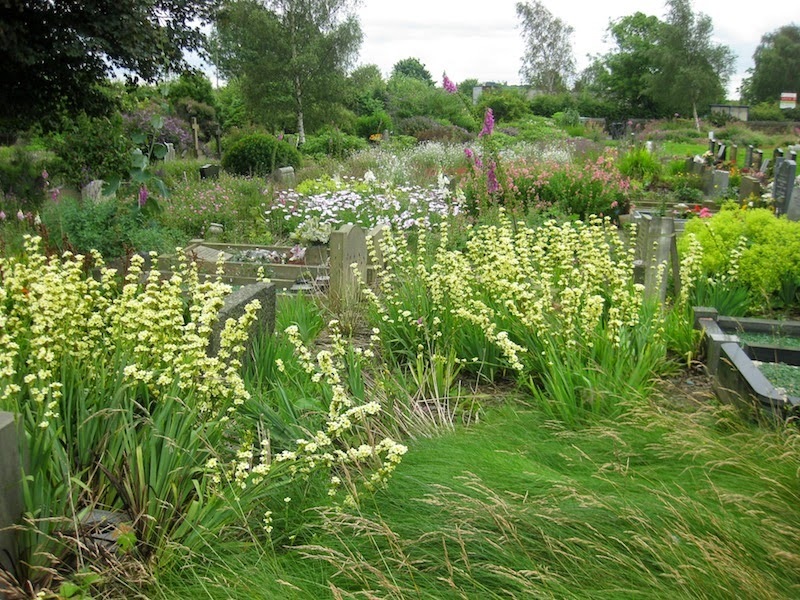 Perhaps I dare mention an occasion when another gardener, the most careful and experienced of sprayers was killing grassy weed near conifers that the previous Autumn had been moved without adequate nursery preparation. The junipers were destined to die when it turned windy and dry in the following Spring. With exquisite timing the grass and the conifers turned yellow at the same time. Need I say more? Even at college, a colleague would go around the borders and each year point out 'herbicide damage' on a clump of acanthus with chlorotic Spring foliage. These exact symptoms are due to inadequate iron uptake when the soil is wet and cold. It is a very temporary effect and is to be seen in gardens that have never seen weed killer. I used to tell students that you could kill plants with impunity if it was by conventional means such as chopping up roots of plants by digging, by pruning or failing to water or almost anything! It was deemed just part of gardening. However a few yellow leaves with transient herbicide damage was a mortal sin. If you were to make a list of merely categories of causes of unexplained sickness or death of plants it would take several pages. You can be sure if herbicides are used in the garden they will always get the blame. I have even blamed them myself with my own spraying before the real cause of damage became apparent. This is NOT glyphosate damage but looks really like it. These temporary symptoms happened as a result of a cold sunless week after the very hot weather last month. The actual photo was taken on our holiday in Tignes. There was zero chance of glyphosate having been used within miles! Over the last forty years I have had my share! The commonest happenstance is walking on sprayed weeds and then on the lawn. Herbicide footprints are very embarrassing and it will take a couple of months for the damage to grow out. An accident born of lack of understanding is when a knapsack sprayer is not 'sprayed out' to empty the diaphragm after using glyphosate and then is used for another purpose such as weed killing the lawn. I have done this once! An incorrectly inserted or worn nozzle can sometimes cause inconvenient drips. The most spectacular damage I have seen was on my recent holiday in Costa Rica. A hotel gardener had a rip on the sprayer hose. There was a wriggly thin line on the grass verges of the complete campus. It is more difficult for me to analyse the damage caused by the inexperienced or carefree sprayer. I can claim to spray the whole of my intricately planted acre garden without damaging a single plant. This might sometimes be less true when I visit my cemetery gardens and I find a patch overgrown with weed and I am prepared to accept a little 'collateral' damage when I speedily spin round more than an acre! Even here where I might cause some transient damage, unless I wish to do so, I never kill an established plant. I cannot repeat often enough glyphosate is not of itself selective and successful spraying needs skilled direction and seasonal timing. It helps if you have an intimate knowledge of the susceptibility of your plants. The inexperienced sprayer will take too long to spray because he is far too careful, but at first, perhaps this is not a bad thing. As you become confident of your skill you can quickly get round. It is perhaps worth mentioning that if a mature large well-established perennial plant just gets a tiny whiff of careless spray you will probably never even know. (Not true of some soft vegetables!) Strong plants have the metabolism to withstand small quantities of poison. This is in contrast with where you deliberately spray plants all over and exploit a large leaf area to deliberately kill them! If using glyphosate is to be a significant part of your gardening it is well worth getting a proper professional knapsack sprayer. It will cost you between 100 to 200 pounds. It will be much better than cheap amateur versions and for most, but not all tasks, much more accurate than a small hand sprayer. I know I have described spraying round relatives's small overgrown gardens with discarded detergent sprayers but I do not really recommend it! Your new knapsack sprayer will last 'for ever': compare the cost with that of your mower! One final point, if you are as bad with flat packs as me, buy your sprayer already assembled! It is perhaps impossible to flat-pack a tank! And what if you inadvertently spray a whole plant? It might be more retrievable than if you had chopped with a hoe or a spade. If you are near a convenient water supply, immediately wash the spray horizontally away with a can. (Don’t let it sink-in in the immediate root zone). If not near a water supply, more desperately, covering with dry dusty absorptive soil may help to soak up the spray. For many plants immediately cutting off contaminated leaves may be a sure way to save it. I had raised two Phygelius capensis plants To my shame, not concentrating, I heavily sprayed this one six weeks ago. My other plant had been planted in Cathi’s garden and shows how the plant should look! Note in this picture her thriving plant has been slit-planted into sprayed-off turf. If you have a precious plant growing in a totally overgrown patch of perennial weed you can sometimes successfully save it by cutting off it's leaves and spraying the weeds - but I offer no guarantees. Another alternative is to carefully lift a plant and pick off all pieces of perennial weed root and in extremis carefully wash the roots before planting in clean soil. Only return to its original place when all weeds are killed. I have sometimes covered precious plants with overturned plant pots before safely spraying around them. Another demonstration. Not realistic here, it would be easier to hand weed, but if the weed happened to be couch grass the method might be relevant! The weedy soil is NOT from my garden (please don’t ask). I can never understand why gardeners find common bindweed difficult to control when it is so sensitive to glyphosate provided it is an intact plant, has luxuriant leaves and ideally it is July! 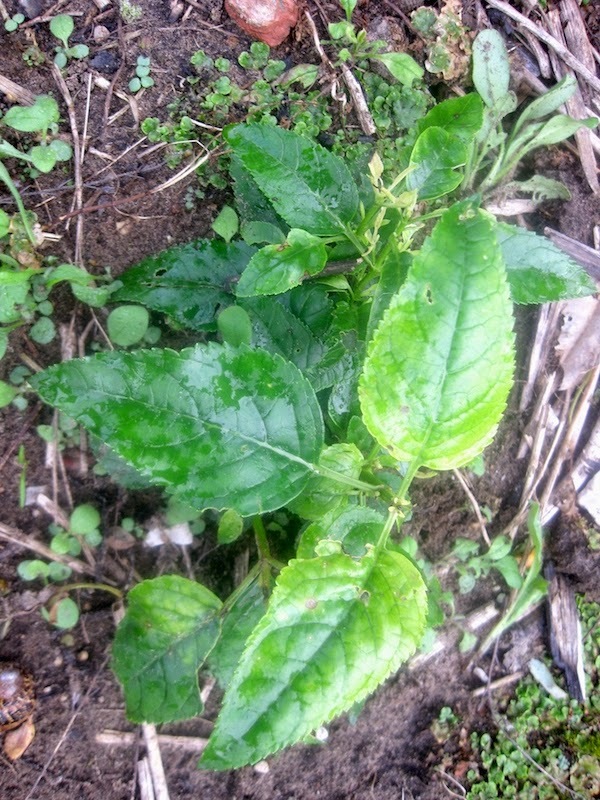 Some gardeners tease it out from surrounding plants and spray little bundles at normal dilution with a hand sprayer with the weed top isolated in a plastic bag. Too slow and fiddly for me. I have personally treated similar little twirled out bundles in herbaceous borders by merely pulling the bundles away from the precious plant and carefully spraying. Even more daring when it is clambering up old hedges, conifers or shrubs just carefully spray the bindweed with a hand sprayer. It will often provide its own screen of protection if rampant! Provided perhaps 80% of the bindweed is sprayed and your privet just gets only a smattering all will be well. Another technique when for example well established perennial grass such as couch grows through a herbaceous perennial - or even easier, a coarse shrub - is to wet your gloved hand with dilute glyphosate and just smear the weed. A student once asked why I just didn't pull it out. He was missing the point! Modern dabbing techniques and gels are too time consuming for me! A professor showed his horticultural students a picture of a huge weed that his herbicide had failed to control. He asked them what he should do and they offered all manner of alternative herbicide solutions. He then declared that they should just pull it out. My own attitudes to weed control are more well rounded than suggested in my glyphosate posts as I explain here. Only last week I spent a couple of hours in my Bolton Percy cemetery garden pulling out cleavers/goose grass and cutting impatiens down with a sickle. If anyone finds a sickle in the cemetery, it's mine! 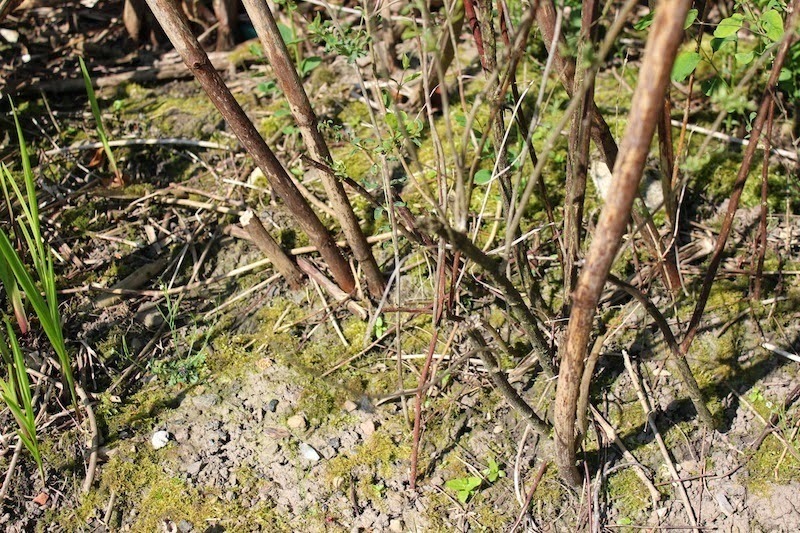 Last year I posted about controlling Japanese knotweed. I described Peter William’s glyphosate injection technique and promised to report back this year. This August there is no sign whatsoever of any regrowth and we conclude it is dead. The green shoots in the picture are snowberry and montbretia and indeed the remarkable thing that over the whole patch all wanted plants are completely unharmed. Bindweed, common convolvulus. If it was difficult to grow everyone would want it. No sooner had I finished writing the above post we made an unexpected visit to Steven in Folkestone. He has moved yet again! This time the house is built into a cliff on Sandgate Hill. Formerly a very fine garden, children and boxer dog permitting it might be again if we make enough visits! Almost completely neglected for 18 months although full of fine plants, it is completely overgrown! The ten foot curtains of bindweed were absolutely magnificent. I was envious that in the balmy Folkestone sea-side climate that this fine Zantedeschia was established as as a perennial plant. What a chance to put my money where my blogging mouth is. I have said often enough how easy it is to control bindweed given the right conditions and every time I metaphorically hear "this man is an idiot". I asked Steven whether he wished to keep this lovely plant. He was rather decisive that he did not! Everything was right for a speedy and definite kill. The bindweed was completely intact and wonderfully strong growing and luxuriant. There had been heavy rain the previous night to perk it up even more. Now dry, it was a warm sunny day. Even better it remained hot and dry for the rest of the weekend. In my opinion July is the very best time to kill bindweed. My weapon was a small, cheap, very accurate hand sprayer. The exercise was to clamber through the steep garden spraying all the leaves of the bindweed without spraying the plants. 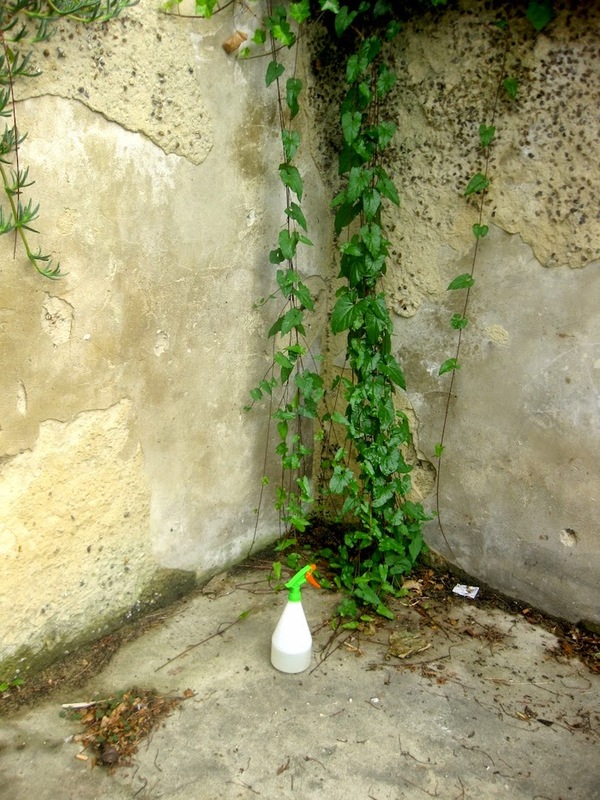 Amateurs excessively fear any spray might be misdirected onto their plants. It takes a very unskilled careless sprayer to harm husky privet, ancient griselinia, ceanothus, hebe, any conifer and almost any large vigorous shrub. You need to aim to cover at least 80% of the bindweed leaves. I managed 90% and made quite sure I did not miss a single weed. My spray was a strong one for me, 1 in 50, commercial 360g glyphosate to water - about three and a half UK teaspoons in my litre of water. Practice with pure water first. Take the nozzle very close to the convolvulus leaf and gently pull the trigger. For the sprayer illustrated move the trigger only part of its travel. A complete pull in little stutters will separately spray several individual leaves. This will be the most skilled parts of the operation. All the other variations will be quicker and easier. I had to be careful over the rose. The conifer hedge would be almost impossible to harm! Usually the canopy of bindweed leaves will be make its own cover over a section of your plant. Vary your direction of spray to wet them and not your plant! The bigger the drift of bindweed the quicker you can be. The convolvulus was so thick here I had to lift the draped curtain to reach more leaves below! Usually bindweed binds very loosely! Un-twirl little bundles and pull them away from the host and spray them. Even in herbaceous borders you can do this if you gently pull out the clusters of bindweed away from your plants. Often the position of the bindweed will help to make it easy and speedy to spray. 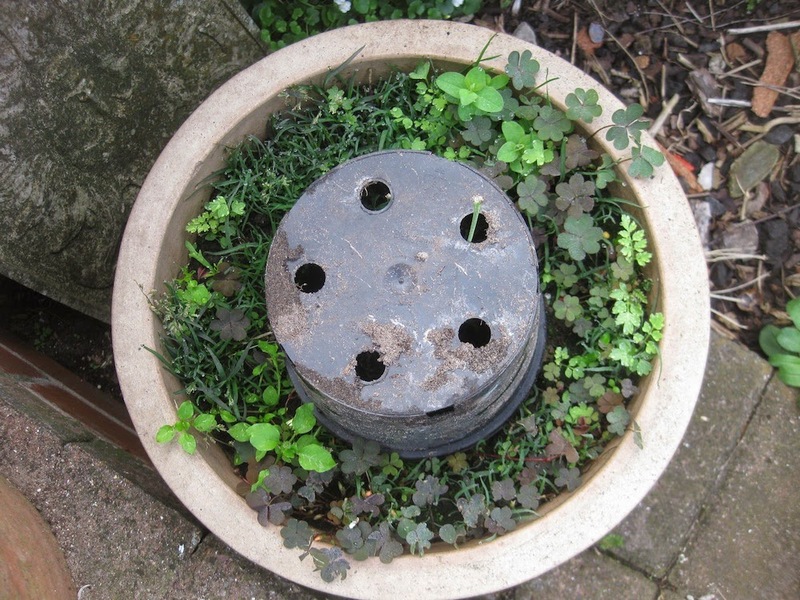 If it clambers over soil, hard surfaces, walls, old ivy, or none-green shrubby bases it makes work very easy. Great curtains tumbled down over some of Steven’s walls. It was the work of a few seconds to spray tracts of a meter! I had to be very careful where a few delicate plants grew under the shrubs and small trees. Twice I needed to pull herbaceous perennials away from the overgrown shrubs. On one occasion I cursed when I sprayed a hidden day lily. It thanked me when I tore off the few contaminated leaves! It is most important to tackle every single bindweed plant. In Steven’s case I had to fight my way to and even beyond his boundary to get to all of the weed. In the 300 square metres of garden there must have been at least a hundred vigorous clumps of bindweed. Steven tells me that after a week they were completely yellow and were starting to shrivel. He will see them no more this year. I am completely confident that 90%of this bindweed will not appear again. The few plants I might have missed will be eliminated next year. It took me less than two hours for the complete operation. I needed one litre of diluted spray. Was it my imagination that when we departed Sunday lunchtime that the convolvulus growing over the jasmine was already starting to yellow? Wear your normal garden clothing when doing this work. You might wish to use waterproof gloves. Remember not to grab desirable plants with wet hands! Strange is n´t it, growing the ´Heavenly Blue´ Ipomoea and destroying the also beautiful white ones. I could not help laughing reading your glypsophate story, I had my own Round-up footprints this summer on the lawn and I am afraid to tell that this was not the first time, so stupid. You're not the only one Janneke! Not my first time either Janneke! Morning neighbour! Yes I remember you muttering about this when your gardener (me), sprayed round recently! Or perhaps you are thinking about when dear Harry got out the glyphosate rather than the lawn weedkiller! I wasn't Roger, but now that you mention it...it was very funny! Our lawn looked like it had leprosy for months! I also love the little rat tails that appear after spraying round trees! You have got me again on that! You don't mean the tassels on the amaranthus I have planted? I really enjoyed your rant against modern potting composts on your post of 21 august. It compliments my own post on compost last month. I loved the way you analysed the stuff they write on the bags- with your photos to illustrate it. What a nerve the firm that promotes itself as environmentally friendly because it composts old timber! Good on Westland composts to tell you they use peat and how good it is. Thanks for the timely post Roger. I am about to create a 30ft border and am planning to use weed killer. My new border will runs along a fence currently supports Lilac, roses, honey suckle etc and beyond the fence is a paddock so I will have to be careful. Dont think I can do your slit method though. As I think the little plug plants that I have grown on in the green house will need a nutritious prepared patch. As long as the weedkiller is glyphosate Sue! The world does not seem to be ready to plant in dead turf! After my more recent planting in Cathi's garden I did give a light dressing of NPK fertiliser. What month is the best for spraying brambles? I'm slowly winning, but every year I try something different on the ones that have come back. This year I tried cutting them back at the beginning of August in the hope they would put on some bushy new growth I could spray, but I think I left it too late. Glyphosate is not that brilliant against brambles, ironic that it is quite damaging to cultivated blackberries. I recommend spraying when it is strong in perhaps late May and to spray any regeneration when that has put on some new growth. Thanks Roger. I didn't realise it didn't work too well on them. I've had reasonable success when there is soft growth, or by treating the roots or thick stems with stump killer strength. I'll look up MCPA and maybe give that a try next year. A both interesting and entertaining post Roger, I like what you did with the title, very droll. I thought that you must have run out of material by now on one of your pet subjects but you have proved me wrong. The description of the treatment of the bindweed takes on an almost surreal quality, one man and his hand sprayer against the invader, I almost felt I was with you. I would be interested to know if you have ever used triclopyr and if so did you find it any better than a strong solution of glyphosate for woody specimens such as brambles? How would you tackle the demise of a Russian Vine? I assume you are wanting to achieve it's demise! The methods I describe with glyphosate on japanese knotweed (use my search box) might help but sometimes their might be so much top that you cannot get high enough. I imagine as a woody climber it has less resources stored in the root than Japanese knotweed and a strategy of completely cutting the whole plant to the ground and then spraying the new growth when it is perhaps a metre high will kill it after a few repeats! Thank you very much for your advice which I shall follow. Who will be coming to Open Day?